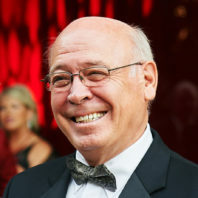 The Washington State University Foundation presented its highest honor—the Weldon B. “Hoot” Gibson Distinguished Volunteer Award—to retired Boeing Commercial Airplanes president and CEO Scott Carson during the 38th Annual Recognition Gala in Pullman, Sept. 28. The WSU Foundation presents the Gibson Award each year to recognize individuals whose service on behalf of WSU and the WSU Foundation is measured by the highest levels of achievement. 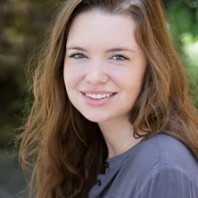 Washington State University alumna Jenny (Chapman) Rose embodies the tenacious Cougar spirit that ignites her passion as a teacher, role model to her three sons, and an activist for K-12 education. Although Jenny recently concluded eight years of service as president of the Spokane Education Association (SEA), her engagement in matters that impact public schools is stronger than ever. Kathleen Irwin celebrated her 102nd birthday in January, at a party at Rockwood Retirement Center in Spokane, where she resides. 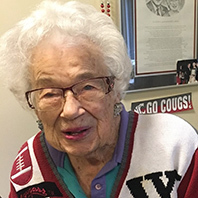 She wore a Cougar Football-themed cardigan and crimson and gray earrings to mark the occasion, and to convey her unwavering loyalty to Washington State University. Inside Kathleen’s apartment, a treasured keepsake hangs in a frame on a wall. 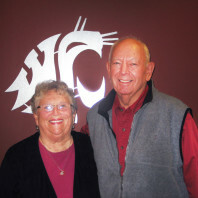 The memento notes the year 1994, when Kathleen and her husband, Claude, were recognized and honored as Benefactors of WSU for their generous commitment to students through the Claude and Kathleen Irwin Regents Scholarship. 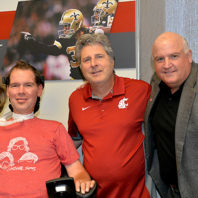 The recruiting room inside the Cougar Football Complex at Washington State University has been named the Steve Gleason Recruit Suite in honor of the WSU Athletic Hall of Famer who played football and baseball 1995-99 and in the NFL 2000-07 for the New Orleans Saints. When Charles Vaughn and his sons, Joe and CJ, established a scholarship in the College of Education at WSU, they created an enduring source of inspiration and encouragement for aspiring elementary teachers. Mary Alice’s Scholarship Fund: Ensuring Teaching Excellence for the Future is a loving tribute to a wife and mother who was an exceptional teacher in all respects. 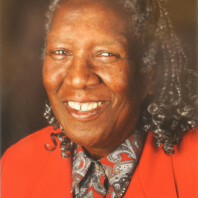 Honoring the late Mary Alice Hall-Vaughn, the scholarship is awarded to certified elementary education majors who embody the personal qualities and professional commitment that Mary Alice possessed. 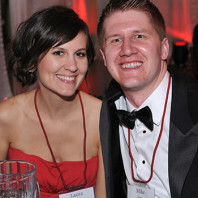 The well-known saying, “Cougs helping Cougs,” is thoroughly embedded in the philanthropic spirit of Voiland College of Engineering and Architecture alumnus Andrew Pilloud (’11). She is gracious and kind, respected and admired, and above all, determined to make a difference. Gladys Jennings (’48) warmly acknowledges family, friends, and colleagues who helped celebrate her 90th birthday. Grateful for the experiences she enjoyed at WSU, Gladys asks that celebratory gestures be directed as gifts to the Agriculture and Home Economics Scholarship Fund or the Alberta Hill Academic Excellence Award at WSU.